NETWORK UPDATE: The reruns of AMERICA’S GOT TALENT and WHOSE LINE IS IT ANYWAY each lost 0.1 in final numbers. CABLE HIGHLIGHTS: A generally slow cable Friday put 4 Disney Channel shows into the top 10. 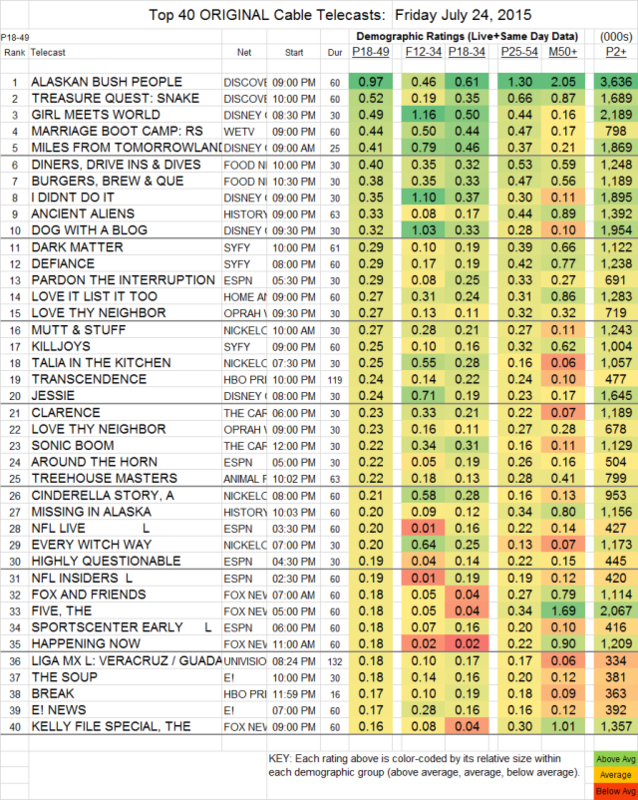 At the top, though, was Discovery, with ALASKAN BUSH PEOPLE down 0.05 to 0.97 and TREASURE QUEST down a tenth to 0.52. Disney’s ranked shows were GIRL MEETS WORLD (down 0.12 to 0.49), a 9AM run of MILES FROM TOMORROWLAND (up 0.09 to 0.41), I DIDN’T DO IT (0.35) and DOG WITH A BLOG (up 0.05 to 0.32). We’s MARRIAGE BOOT CMP gained 0.06 to 0.44. Food Network had DINERS, DRIVE-INS & DIVES down 0.02 to 0.40 and BURGERS, BREW & QUE also down 0.02 to 0.38. History’s ANCIENT ALIENS was at 0.33. Once again, Syfy’s trio of scripted originals were closely packed, with DARK MATTER and DEFIANCE both at 0.29 (respectively up 0.04 and up 0.06) and KILLJOYS at 0.25 (up 0.01). OWN’s LOVE THY NEIGHBOR rose 0.05 to 0.27. BIG BROTHER AFTER DARK (POP) was at 0.07/134K.